My dreams were a jumble of violent chaos. Thrashing limbs. Bruising grips. Churning shadows. And through it all was that never-ending screech, now a hoarse echo of its former strength, but no less painful. The problem with getting everything you wanted in life is hat you're not prepared for disappointment when it comes. I considered it my pleasure to acquaint Sophie with that concept. "Do you have some kind of disorder? SOme synapse misfiring up there-" he gestured vaguely toward Nash's head "-that makes you incapable of keeping your mouth shut? Or are you just a garden-variety fool?" I glanced at the reaper with my brows raised. Tod shrugged and grinned. "He can't see me. Or hear me unless I want him to." Then he turned to Nash, and I understood that whatever he said next, Nash would hear. "And until he apologizes, you and I will carry on all of our conversations without him." I wanted to explain that things would get better. He would stop trying so hard - start realizing I was sixteen, not six - and eventually he'd understand that Nash was keeping me out of trouble, not getting me into it. When that happened, we could both relax. Maybe he could even tell me about my mother without tearing up and making some excuse to stop talking. But not yet. None of that could happen while I was still helping [them] behind his back. Because he knew something was wrong, and he couldn't move beyond that until it was resolved, and I couldn't look him in the eye until I was done lying. 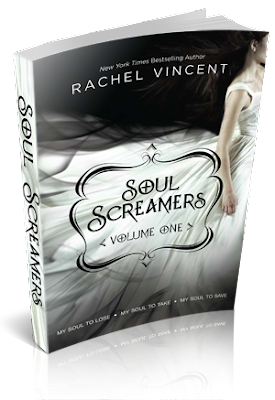 This is a great introduction to the Soul Screamers series. It gets you interested, but at the same time doesn't divulge any pertinent information. Vincent introduces us to the main players of the series, well all but two anyway, and to Kaylee's affliction. (I'm not really sure what else to call it.) Kaylee has the knack for detecting when somebody around her is going to die. She doesn't know how or when exactly, but knows that it will be soon, within minutes usually. Unfortunately, instead of being able to warn this poor soul (see what I did there? ), she let's out an ear piercing scream and cannot stop until said individual's soul is gone. Kaylee has been a victim of whatever this is for years, but has always been able to get away in time that it's never become really an issue. This time she wasn't so lucky and ends up yelling her head off in the middle of Sears, unable to stop. Eventually she passes out and awakens tied to a bed (not like that you dirty birdies) in a mental hospital. While in the hospital, Kaylee encounters a young girl, Lydia, who sits by herself and just stares at her. Nothing more. I got the feeling that Lydia knew something about Kaylee, but I don't know what. I'm not sure if we'll encounter her later in the series or not, but I found her to be very intriguing and hope that we do. After a visit from her Uncle Brendon and Aunt Val, her guardians since her mother's death and father's departure for Ireland when she was about three, they decide that this isn't the place for Kaylee and she belongs at home. We have answers! But I won't tell you what they are! After sneaking into a 18+ club with Emma, Kaylee is approached by Nash Hudson. Her crush and one of the most popular boys in school. Feeling a "panic attack" coming on, Nash and Emma take Kaylee outside in the alley where she confesses to both of them that a girl in the club is going to die. They find out the next morning that she was right. Nash begins to take an interest in Kaylee. He seems worried about her and concerned on an intense level, which I found to be rather odd since the first time they really interacted was when he approached her at the club. While Vincent does explain the seemingly instant attraction (don't worry, it's not in insta-love), I would have liked to see more of a foundation to the relationship; however, I guess all relationships have to start off somewhere. The new addition that I really like is Tod, a reaper. Tod is a snarky little fellow with quite the sense of humor. He is connected with one of the characters in a very special way - but to say who and how would spoil it! Things become more engaging and scarier as we delve deeper into the world of bean sidhes, reapers, and the Netherworld. It turns out that humans can sell their souls to hellions for fame, fortune, and all the perks. Of course, it is damning their eternal soul to be tortured for the rest of eternity, but what can you do? Tod enlists Nash and Kaylee's help to save the soul of his ex-girlfriend, Addison Page, a starlet from the Dekker Media "entertainment titan." Addy sold her sold years ago to obtain her dreams, but after hearing her explanation, part of me can't fault her for it. I feel bad for Addy and as the novel progressed, I pitied her more and more. We get to see a different side of Tod in My Soul to Take. We see beyond his snarky attitude to see a young man who still cares about those that he loves. He wants to save Addy at all costs, but there's only so much he can do. I liked Tod when we first met him, but now I love him. As far as Aiden, Kaylee's dad, is concerned, I feel bad for him, too. He's been absent from Kaylee's life for thirteen years and has now stepped into the role as her father - it's hard on both of them. He's working a factory job to keep ends meat, renting a small house filled with used furniture, and Kaylee is keeping secrets. Kaylee doesn't inform him of her assisting Abby and as a result is keeping secrets, breaking curfew, and sneaking out. I can't fault Aiden for shortening his leash and demanding to know where she's been and what she's been doing. I also can't fault Kaylee for being hurt/annoyed that her dad decided to come be a parent after all this time, despite his reasons for staying away. Kaylee is a strong character and accepts her role in the world with grace and a desire to understand everything. Not only that, but she is clever enough to come up with solutions to the issues at hand, but at the same time, doesn't believe that she is infallible. She knows that she still has a lot to learn about this new world she finds herself in, but is determined to help others. She's incapable of sitting back and doing nothing. At the same time, she learns that she "couldn't save them all, and on [her] good days, [she has] to admit that he was right. Eventually people have to learn to make their own decisions, and to deal with the consequences. Including [her]" (566). However, I would like to see Kaylee trusting her dad more. He's over one-hundred years old and while he wont' always agree with what she is doing, he knows more about this world than she does. I would also like to see Kaylee hanging out with Emma more. Emma is her best friend, but I find her being put to the side in favor of Nash. Emma seems to only come around when Kaylee needs something - an alibi, a ride, a car. I can understand Kalee's desire to keep Emma safe, but that doesn't mean ignoring her completely. I find the Soul Screamers series to be an extremely compelling read with strong characters, engaging plots, and detailed writing. Vincent brings these characters and an entire new world to life. These unique stories grip your imagination with vivid scenes, witty dialogue, and believable (as far as paranormal stories go) plot points. Click the banner for the whole SPOOK-tastic schedule!